Senior Lecturer in Economics at the University of Limerick. This is a guest blog from Benefacts.ie’s MD Patricia Quinn. There’s no tag on the Irish Economy for “nonprofit” or even “charity” – maybe a symptom of the almost total lack of data until now on the organisations that make up this sector in Ireland. Hopefully, this is about to change. “Non-profit institutions serving households, abbreviated as NPISH, make up an institutional sector in the context of national accounts consisting of non-profit institutions which are not mainly financed and controlled by government and which provide goods or services to households for free or at prices that are not economically significant. Examples include churches and religious societies, sports and other clubs, trade unions and political parties. A simpler way to think of this set of organisations is: all those that are neither part of the private sector, nor part of government. Some are charities, some are not – either because they are explicitly excluded from the definition in law by the Charities Act, 2009, or because they haven’t got around to registering yet. About half are incorporated, mostly under the Companies Act (as CLGs), although there are also hundreds of industrial, friendly or provident societies including trade unions, and a handful that were incorporated by statute, some of them – like some major voluntary hospitals – prior to the foundation of the State. There are also thousands of church or faith bodies, as well as sports, cultural and recreational clubs, societies and associations. The number of ~20,000 includes all of those nonprofits that are registered with and required to return information to at least one national public authority – the Companies Registration Office, Revenue (for tax relief as charities, schools or sports bodies), the Charities Regulator, the Library of the Houses of the Oireachtas. Many thousands more are not included on national registers but are governed by national bodies (for religion, sport etc) – hopefully for future inclusion in the Database. Having identified its scope, Benefacts harvests data every day from multiple public sources, sometimes availing of open data files and – for financial and governance data – extracting it manually from financial statements and other regulatory filings. Benefacts doesn’t ‘scrape’ other peoples’ websites, but we do add some additional information including a classification (following Eurostat norms), the URL of each nonprofit, and information about compliance with some voluntary codes. This model, which is co-funded by government and philanthropies, means that there’s no effort required of any nonprofit to be included. A free public website – benefacts.ie – provides user-friendly access to extracts from the currently available data and public files on each listed nonprofit, there’s a public API that allows users to download the same information as a data feed, and a new customised service for institutional users to support governance, risk and compliance analysis (Benefacts Analytics). Users in government like the CSO, the Charities Regulator, IGEES analysts and internal auditors have had bespoke reports with more granular data extracted from financial statements (balance sheet, I&E, notes to the accounts), reflecting their particular requirements. Earlier in 2017, using the full population of available data, we published the first in an annual series of reports analysing the nonprofit sector in Ireland. We intended this as a billboard, drawing public attention to some of the main features of the sector, and starting to explode some myths. The Irish nonprofit sector is hidden in plain view. It employs 150,000 people, and has an aggregate turnover of €11bn, only 18% of which is derived from government grants. Service fees from Government account for 31% of the sector’s revenues – mostly in the health and social services sub-sectors – but only 2,700 nonprofits rely on government funding of any kind. Remuneration data available for the first time in 2015 under FRS102 indicates that only 0.5% of people working in independent nonprofits – excluding those where salaries are pegged to governmental paygrades – receive annual remuneration of more than €70,000: this compares to 12.8% of people in the population at large. This is all very interesting, but it is only scratching the surface. Since 2015, Benefacts has been harvesting extensive financial and governance data from the financial and constitutional documents of thousands of nonprofits, and socialising the data on various platforms. The nonprofit sector will continue to be the Cindarella of the Irish economy until such time as the Database of Irish Nonprofits starts being used by economists who will put our dataset in the wider context. Where is Prince Charming? Dublin Chamber is recruiting an Economist to work as part of the Chamber’s dedicated policy team. The Economist will be responsible for the development and dissemination of accurate, timely reports and analyses. Prepare economic research and policy positions on issues of relevance to the Dublin business community. Analyse and disseminate information on Dublin and the Irish economy. Analyse public policy developments for their impact on Dublin and on business. Draft key policy documents and reports. Contribute to the research agenda of the department, including servicing policy taskforces. Prepare member-driven submissions to Government and contribute to Dublin Chamber’s work on policy briefs which enhance its reputation as a thought-leader on policy research. Honours degree in economics or closely related discipline. A relevant post graduate qualification is an advantage. Thorough understanding of economic theory and policy, and current economic issues. Familiarity with economic data sources and other information. Excellent numerical analysis and report writing skills. Ability to communicate succinctly and utilise a range of communication methods as appropriate. This challenging and rewarding role requires building close professional relationship with senior leaders in business, research institutions and the public sector. The ideal candidate will have 5 year’s relevant experience. This is a full time permanent contract, with salary commensurate with experience. Applicants should send a CV and cover letter to aebhric@dublinchamber.ie by 5pm Friday 28th July. 730 days to go, and questions for us all. Worth putting up a thread on this today. The ESRI’s Pete Lunn and David Duffy apply some fairly fancy econometrics in the latest issue of the Economic and Social Review to show what Leinster supporters like myself know simply by looking into our hearts. BOD is the greatest. Nobody show this to Ryle Nugent. The fifth annual NERI Labour Market Conference will be held on Friday 12th May in association with Maynooth University’s Department of Applied Social Studies, the Department of Economics, Finance and Accounting and the Department of Sociology. The conference will run from 10:00am-16.00pm and will include research papers on various aspects of the Irish labour market and Irish labour market policy. The Miriam Hederman O’Brien Prize is awarded by the Foundation for Fiscal Studies (http://www.fiscal.ie). The prize was launched in 2013 and you now have an opportunity to nominate candidates for the 2017 prize. The purpose of the prize is to recognise outstanding contributors to matters relating to fiscal, economic and social policy. The winner will be awarded a prize of €1,000 together with a commemorative Gold Medal. Nominations are invited for work completed during 2016 that has added to the public knowledge or understanding in areas such as taxation, public expenditure and other related fiscal policy topics. Details of the prize, entry criteria and submission details are contained here. You can nominate your own work or work by others. The closing date for nominations is 30 April 2017. The Annual RSA conference is on in Trinity College, Dublin this year from the 4th to the 7th of June. The programme looks fascinating. Harvard’s Ricardo Hausmann is among the keynote speakers. Given the extended discussions being had across Ireland on housing policy, on spatial modeling and on ‘balanced regional development’, it promises to be a good conference. Trinity are advertising an Assistant Professorship in Economics with a focus on international macroeconomics, though all fields are welcome to apply. The job ad is here. Two interesting think pieces in the Irish Times today. One by TCD’s Brian Lucey on the challenges and opportunities facing Ireland’s Higher Education sector after Brexit, and another by UCC’s Phillip O’Kane on creating a single International University of Ireland made of the best bits of the higher education landscape. the level of Irish output is permanently below what it otherwise would have been in the absence of BREXIT. The Kilkenomics festival programme is live here. Speakers include Dan Ariely, Mark Blyth, Diane Coyle, Bill Emmott, Tim Harford, Wolfgang Munchau, Stephanie Kelton, Deirdre McCloskey, Martin Sandbu, Kimberly Scarf, Nassim Taleb and Linda Yueh. Quite a number of this blog’s contributors will be there over the weekend. I know I’m looking forward to it. John was the first chair of Ireland’s fiscal advisory council, and he can take a share of the credit for the development of IFAC in terms of its analytical capability as well as the organisation supporting the Council members as his term ends. The Irish Times carries the details here. Speeches start at 1pm; as is now traditional, the whole thing has essentially been leaked to the papers, see here and here for representative samples, there’s also a live stream with the relevant documentation beside it. Comment moderation is off to simulate the ‘live blog’ thing I still can’t quite get right on this site. Tomorrow we will know the recipient of the Nobel Prize in Economics. This is not a ‘true’ Nobel, coming some 50 years after Alfred Nobel established the original prizes in physics, medicine, chemistry, literature, and peace. The Swedish Central Bank established the Prize in Economic Sciences in Memory of Alfred Nobel in the late 1960s as a way to counter what it saw as the virulent spread of social democracy across Nordic countries in particular. The Nobel Factor, a new book by Avner Offer and Gabriel Söderberg, traces the development of the Nobel Prize in economics, which grants authority and ‘Nobel magic’ to economics above other social sciences, and ensures laureates are listened to on every subject. Economics itself is seen as being more scientific, more worthy of the ears of the powerful, as a result of the Nobel prize. The impact of neoclassical economics, the dominant form of economics which emphasises market based interactions above all others on policy makers through teaching and research, is assured because of the Nobel prize. Offer and Söderberg begin their book with what may well be the best combined explanation, intellectual history, and critique of neoclassical economics and its policy variants I’ve ever read. From there we have a discussion of the social and economic context for the creation of the prize in economic sciences, and an extended discussion of the conflict between free market and social democratic values in the Nordic states in particular. There’s a really interesting series of chapters tracing the evolution of European politics and the individual awards and their subject areas. There’s a great chapter focusing on Assar Lindbeck, a forceful personality and someone who shaped the Prize. The story gets a little more complicated once the Prize itself evolves, because it’s not a simple case of rewarding only those who espouse ‘markets are great’ approaches, like Friedman and Hayek. For example in Chapter 7, we learn a lot about empiricists, experimentalists, econometricians and behaviouralists who won the Prize because of their rejection of equilibrium approaches to economics. In Chapter 10, the failure of economics to understand, model, or respond to the growing threats posed by unfettered global capital markets gets a very thorough treatment. Overall I found the book riveting in that it is written in a deep and scholarly way. I buy the ‘Social Democracy vs Markets’ argument about the genesis of the economics Nobel in the 1960s, but I’m not sure the evolution of the Prize is as clear cut as it could be, after awards to people like Oliver Williamson and Lin Ostrom and Vernon Smith. “To recapture validity, economics has to come down to the ground of argument, evidence, and counterargument, supported by reason and an open mind. In the quest for valid knowledge, for those of Enlightenment disposition, it is well to ignore black boxes, the magic of prizes, and the lure of immutable laws”. I couldn’t agree more. As intellectual, social, and political history, the Nobel Factor is well worth your time getting stuck into. My wish for tomorrow’s Prize: Duncan Foley for his work on Public Goods and General Equilibrium, and Charles Manski for his work on just about everything else. The box below should display the Nobel citation tomorrow around lunchtime. Three thoughts after reading the UK Prime Minister’s Brexit speech. This is the opening salvo of a negotiation. Everything needs to be understood (and therefore, deflated) in this context. In different places in the speech, Mrs May is talking about restricting immigration *and* having unrestricted free trade. This is a nonsense, and it won’t work. Her description of the process also completely underestimates the negotiating power of the EU. For example, Mrs May said she wants to give “British companies the maximum freedom to trade and operate in the single market”, but not at the expense of allowing free movement of workers for these companies or accepting the power of the European Court of Justice. Best of luck with that. Beyond rallying the troops a bit, and giving a timeline, there’s little in the speech for Ireland, news-wise, apart from what seems like a very firm decision to negotiate as a United Kingdom–meaning our friends up North and in Scotland are in a bit of trouble as there will likely be fewer border-related concessions for them in the context of a ‘hard’ Brexit. Author Stephen KinsellaPosted on September 7, 2016 Categories Climate change, Fiscal Policy, Uncategorized9 Comments on How much of Ireland’s “fiscal space” will climate inaction consume? IGEES is a key part of the Civil Service’s response to the 2007/8 crisis. Interested applicants can check out the details here. Closing date is September 15th. Vox EU carry an interview with Patrick here. You should be able to listen to it by clicking the bar below. The NTMA are out with a really interesting note here (.pdf). 3 sectors–pharma, manufacturing, and finance and insurance–are responsible for 69.5% of all corporation tax. Worth contrasting with Paul Tancred of Revenue’s earlier work trying to understand the problem here. The two numbers everyone will focus on are the 13% drop in customs taxes and the 16% drop in corporation tax. In terms of money in the door up to July, the State is still up 8.5% on last year, so we shouldn’t be too worried about the supply of sweeties come Budget day just yet. The other important thing to note is just how volatile these data are–they bounce around a lot, and you can read very little into one month’s data. So please, before everyone runs off saying Brexit is killing the Irish economy, it isn’t. Or perhaps more accurately, it isn’t just yet. 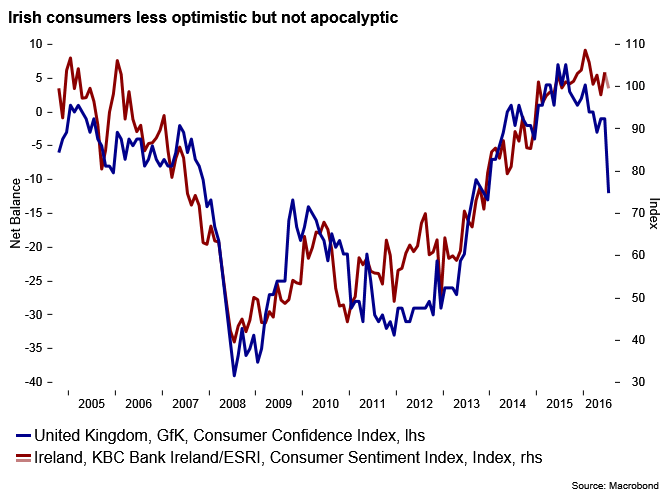 Another interesting piece of data shows Irish consumers are a bit put off but unlikely to develop Brexit flu from contact with their nearest neighbour. While UK PMI data is nose-bleed inducing, the recently-released KBC consumer sentiment index shows that Irish consumer sentiment declined in July, but the scale of the drop was relatively modest when measured beside its UK equivalent, as the chart below shows. So what do we see? We see a bit of concern, and bit of a wobble, but that’s all, up to now. Hold fire on the pronouncements of doom for a few more months at least. Author Stephen KinsellaPosted on August 3, 2016 Categories Brexit, Fiscal Policy11 Comments on Brexit Flu? In addition to being more active, the blog is a bit more social, too. There are buttons at the end of every post to share blog links across the main networks, email them, and print them out. You can follow the blog on RSS, as well as comment updates here. Subscribe to get new posts in your inbox using the widget to the right. A Twitter Feed bot is here. The blog’s Facebook page is here.